1. The source of all electricity is ______. It’s SI unit is _________. 2. The net charge flowing through a cross section of a conductor in unit time is called ________. 3. Electric potential difference between points in an electric circuit is the ______ _______ to move a unit charge from one point to other. i.e. 1V = ____/1C. 4. Current is measured in Amperes using _______. 5. If 90 coulombs charge passes through the conductor for 5 minutes, then the current in the conductor is _____. 6. A _________ is an electronic measuring instrument the combines several measuring functions (electric potential difference, electric current and electric resistance) in one unit. 7. SI unit of electric potential difference is _______. 8. When the cells of 1V , 1.5V, 2V, are connected in series then the resultant potential difference is _____. 10. SI unit electric resistance is ________. 11. The resistance of a conductor is directly proportional to its _____. 12. The _________ of the material is the resistance per unit length of a unit cross section of the material. 13. Units of specific resistance _____. 14. When two resistances of 6 Ω and 12 Ω are connected in series then the effective resistance is _____. 15. 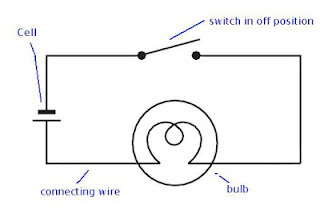 When two resistances of 6 Ω and 12 Ω are connected in parallel then the effective resistance is _____. 16. A 1.5 V battery is connected such that a current of 0.15A flows through the circuit. Then the resistance of the conductor is ____________. 17. The effective resistance is less than any individual resistances when resistances are connected in _________. 18. Two or more resistors are said to be connected in _______ if same current flows through them. 19. The electric power is the product of __________ and the __________. 20. SI Unit of power is ___________. 21. The units of house hold consumption of electrical energy are _____.